Shopping for a new Nissan Armada? We like the Armada Platinum trim’s luxury equipment for less money, especially with its f active safety equipment. The 2019 Nissan Armada is a wide family team bus with plenty of capability and a relatively low price tag. Hauling an army of children apparently takes a war wagon. The 2019 Nissan Armada sounds up to the task. Offered in SV, SL, Platinum, and Platinum Reserve trim levels, the Nissan Armada is more luxurious than its mainstream badge would indicate. It’s related to the Infiniti QX80 and is sold as the Nissan Patrol in other parts of the world. Only offered with a 5.6-liter V-8 that makes 390 horsepower, the Armada is capable and competent albeit very thirsty. A 7-speed automatic is mated to the big V-8 and sends power to the rear wheels, or all four wheels when equipped. Like other body-on-frame SUVs, the Armada is rated to tow sizable toys. When equipped, the Armada can drag up to 8,500 pounds behind its rear bumper, enough for a boat or camper or trailer full of toys. The Armada’s best features are found inside, with plenty of room in the front two rows for adults and a third row that’s best suited for children. Cargo space is reasonable when all three rows of seats are in place, but the Armada maxes out with more than 95 cubic feet of room with the first two seats out of the way—a sea of empty space, perhaps. This year Nissan makes automatic emergency braking standard on the Armada; it also gets an 8.0-inch infotainment touchscreen. Most of the Armada’s equipment feels just a few years behind the times, though. And we’d like it better if Nissan handed over infotainment duties to smartphones via Apple CarPlay or Android Auto, but that’s not in the cards this year. The 2019 Nissan Armada doesn’t hide its bulky exterior well, but the big body is a boon to interior room. Normally, we wouldn’t knock curvy, but the 2019 Nissan Armada wears just a few too many bends for our tastes. In many ways, the Armada looks like a casually dressed Infiniti QX80. The Nissan wears less chrome on its exterior, with fewer flashy parts, but the Armada is hardly subtle. 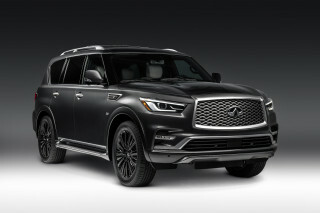 From the sides, the Armada looks the most like the QX80, up front the big Nissan’s grille is punctuated by two V-shaped bars to mimic the brand’s styling language. In back, the Armada looks less like the QX80, but we’re not sure which is better. The Nissan uses a rounder rump and clear lenses on the taillights—we’re not sure if it works. We’re more convinced inside, where the Armada is reasonably upscale—even if it’s in the least expensive SV grade without leather and chrome. Platinum Reserve trims might sound like top-shelf bourbon but paying more doesn’t necessarily make us feel better in the morning either—tony trims are just busier inside. The Armada uses a dizzying number of buttons and controls, but they’re all easily mapped and handy after just a few hours. The curvy dashboard doesn’t rob any room from passengers, and we like the tall riding position for all passengers that offers a good view outside. 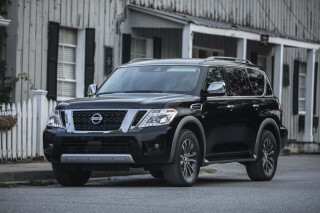 The 2019 Nissan Armada smooth and powerful, it’s best when loaded full of gear and people. Body-on-frame SUVs like the 2019 Nissan Armada are better when towing or hauling large families, not carving canyons or navigating tight parking lots. 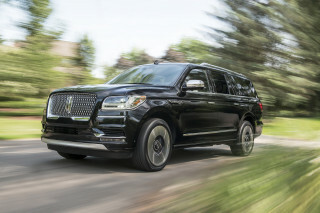 All Armadas get a 5.6-liter V-8 shared with Titan full-size pickup trucks and the Infiniti QX80. The engine is rated at 390 horsepower and 394 pound-feet of torque and can tow up to 8,500 pounds, when equipped. We’ve pegged the Armada’s 0-60 mph acceleration at around seven seconds, hilariously fast for a 6,000-pound SUV full of people and cargo. It’s best when not taxed for drag-strip duty and calmly—and competently—shuttling the Armada up mountain passes to the next ski stop. A smooth shifting 7-speed automatic shuttles power to the rear or all four wheels, when optionally equipped. The Armada’s four-wheel independent suspension helps, too. Unlike the related QX80, which uses an air suspension, the Armada uses a coil-spring setup, but the ride quality doesn’t suffer. The ride is predictably best with taller sidewalls found on the SV’s 18-inch wheels, but the 20-inchers that are more commonly found on most Armadas aren’t unduly harsh. Tall-riding SUVs like the 2019 Armada lean heavily into corners, but the big Nissan controls its body motions well. We’ve had no problems taking the big SUV around town and through mountain passes, although its wide track doesn’t necessarily acquit itself well to narrow trails and cramped paths. 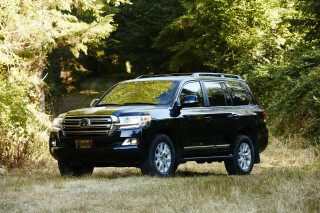 We have noticed that there’s very little steering feel and the wheel is too light for such a big SUV. The 2019 Nissan Armada excels at hauling people and cargo with a surprising level of luxury. Few vehicles are equipped as well as the 2019 Nissan Armada at hauling large families—it’s part of the name, after all. The Armada SV is the only trim level equipped with cloth seats, but every trim gets good-looking interior appointments with soft-touch materials, fake wood trim, and chrome accents. Platinum and Platinum Reserve trim levels get leather accents splayed across the doors. The front seats are accommodating and comfortable, and while they’re not the same seats from Nissan’s famed repertoire of ergonomically efficient thrones, the Armada’s front seats are all-day pleasant. The view from the front seats is predictably good, a boon for tall-riding SUVs that offer a commanding view of the road. The rear seats are available as a three-person, split bench in every trim, or as two captain’s chairs in SL, Platinum, and Platinum Reserve versions. We haven’t had a chance to sample the bench seats, but the leg room is generally good with 41 inches of stretch out space in all versions. The second-row seats recline and slide in every model, and are heated in Platinum grades. The third-row seats are serviceable, albeit hard to access for adults. With scant 28.4 inches of leg room, the last row is best reserved for children. With all three rows in place, the Armada offers 16.5 cubic feet of cargo room, mostly vertical space. With the third row tumbled down, the space opens up to nearly 50 cubic feet and with only the first row in place, the Armada opens up to more than 95 cubes. In all versions of the Armada, we’ve found the fit and finish to be on par with most premium or luxury vehicles, if not a little behind the times compared to its rivals for tech. What scores are available aren’t great, but the 2019 Armada is equipped with standard automatic emergency braking. According to the NHTSA, the Armada earned a four-star overall score, including rare three-star scores for front crash safety and rollover safety. Put simply, that’s not up to par. This year, the news for the 2019 Armada is standard automatic emergency braking on every trim level. Adaptive cruise control and a rear-seat reminder are standard, too. Those are good, common-sense active safety features that complement available blind-spot monitors, active lane control, parking sensors, and a camera-based rearview mirror that are standard on Platinum and Platinum Reserve trim levels, optional on SL trims (except for the camera-based rearview mirror). Aside from active safety features, the Armada is equipped with six airbags, traction control, and a rearview camera. Platinum and Platinum Reserve trims are equipped with a camera-based rearview mirror. The 2019 Nissan Armada comes equipped with a flotilla of good features, but it gets modestly luxurious toward the top trims. For more than $48,000 to start, no 2019 Nissan Armada leaves the factory poorly equipped. With the Armada, Nissan offers the big SUV in four trim levels with scant options in between. The Armada comes in SV, SL, Platinum, and Platinum Reserve trims that are separated by roughly $20,000. All-in, the Armada Platinum reserve offers 20-inch wheels, two-tone leather upholstery, heated steering wheel, a power liftgate, second-row captain’s chairs, dual 7.0-inch screens for rear seat entertainment, and chrome all around, for less than $70,000. That’s compelling, especially considering that rivals from luxury brands such as Cadillac and Mercedes-Benz can cost tens of thousands more. We see the Armada’s best value toward the top, but not at the top. 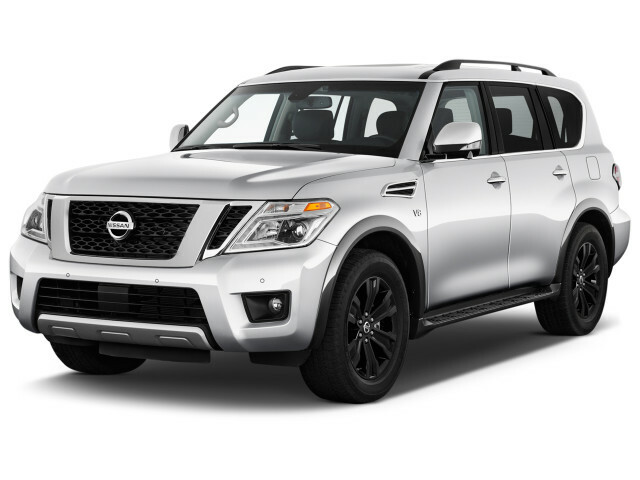 The 2019 Nissan Armada Platinum offers luxury features starting for around $64,000 that include leather upholstery, rear seat entertainment, an 8.0-inch touchscreen, a surround-view camera system, blind-spot monitors, active lane control, and 20-inch wheels. For a family vehicle, the 2019 Armada Platinum is very expensive—among luxury SUVs, it’s a relative value. The SL trim level is roughly $8,000 less, but it lacks key features such as active lane control, a surround-view camera system, and a camera-based rearview mirror that can help drivers maneuver the bulky vehicle. Nissan’s infotainment system isn’t as user-friendly as others on the market, and in the Armada, it lacks Apple CarPlay or Android Auto compatibility. For a new car with a lackluster user interface, we wish Nissan would hand the keys over to one of those popular smartphone systems already. You weren’t expecting good fuel economy from the 6,000-pound 2019 Nissan Armada, were you? Fuel economy isn’t the 2019 Nissan Armada’s first order of the day. Federal testers gave the four-wheel-drive equipped Armada a 13 mpg city, 18 highway, 15 combined rating. Opting for rear-wheel drive doesn’t do much better: 14/19/16 mpg. 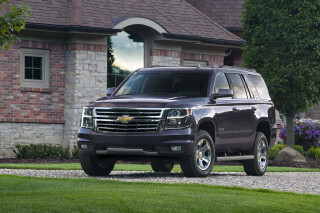 Big SUVs aren’t known for good fuel economy, but several do better than the Armada. 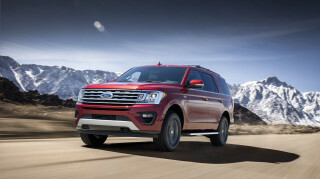 The Chevy Tahoe is rated around 19 mpg combined and the Ford Expedition manages roughly similar. People-moving minivans manage combined mileage around 22 mpg.